Presidential candidates and congressional leaders said Sunday they were stunned and heartbroken by news of the mass shooting at Orlando's Pulse nightclub. Presumptive Democratic nominee Hillary Clinton tweeted that she "woke up to hear the devastating news from Florida. As we wait for more information, my thoughts are with those affected by this horrific act." Presumptive Republican nominee Donald Trump tweeted: "Horrific incident in Florida. Praying for all the victims and their families. When will this stop? When will we get tough, smart and vigilant?" Sen. Bernie Sanders of Vermont, who remains in the race for the Democratic nomination, called the shooting "horrific" and "unthinkable." "We should not be selling automatic weapons which are designed to kill people," Sanders said on NBC's Meet the Press. "We have got to do everything that we can on top of that to make sure that guns do not fall into the hands of people who should not have them, criminals, people who are mentally ill. So that struggles continues." Congressional leaders also reacted with horror to the shooting that authorities say left 50 dead. "We are horrified and heartbroken to see such hate leveled at so many people hoping just to spend a night out dancing," said House Minority Leader Nancy Pelosi, D-Calif. "Our hearts ache for all those killed in this senseless attack, and we pray for the swift recovery of all those who were wounded. While many questions have yet to be answered, the pain of this attack in a mainstay of the Orlando LGBT community is surely magnified as our nation celebrates LGBT Pride month." "We will not allow hate and terror to succeed in blinding us with fear," Pelosi added. House Speaker Paul Ryan, R-Wis., wrote on Twitter that he is praying "for those brutally attacked in Orlando." "While we must learn more about the attacker, the victims and families will not be forgotten," Ryan tweeted. Sen. Ron Johnson, R-Wis., chairman of the Senate Homeland Security and Governmental Affairs Committee, said his committee "will work to support the federal role in investigating this terror attack and protecting against further threats." "As Americans we must unite to defeat terrorism’s threat to our nation's security," he said. Sen. Ben Sasse, R-Neb., who also serves on the Senate Homeland Security Committee, said the attack may be "the latest front" for Islamic extremists. "We know that violent Islam is bent on turning American cities into war zones and, given comments from the FBI, it appears that Orlando could be the latest front," Sasse said. "We mourn the deaths of innocent victims, all made in the image of God. Violent Islam, whether its card-carrying members of ISIS or al-Qa’ida or its crowd-sourced attackers, must be defeated." Members of the Congressional LGBT Equality Caucus today said they were horrified by the shooting. 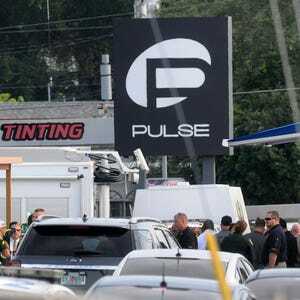 "Though details are still emerging, an attack during Pride Month against Pulse, an iconic gathering place for LGBT Floridians, has a particularly insidious impact on our entire community," said Roddy Flynn, the group's executive director. "Our thoughts and prayers are with everyone affected by this tragedy." Sen. Marco Rubio, R-Fla., appealed for blood donations from Orlando-area residents to help shooting victims. "Our prayers are with those injured and killed early this morning in horrifying act of terror in Orlando," Rubio wrote on Twitter.